My Little Pony may be familiar to most as a childhood classic, but its making a comeback in Shanghai through a special store rebranding. 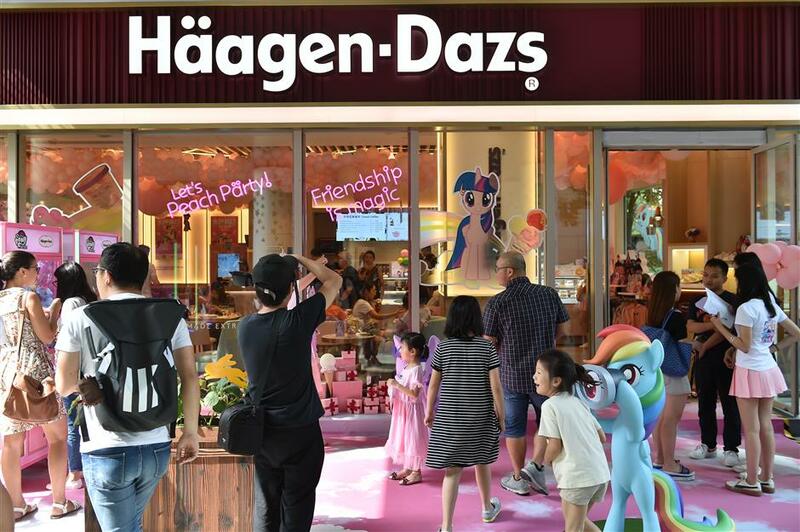 A Haagen-Dazs outlet in The Place shopping area on Zunyi Road has become a hot spot after it transformed into a fantasy land in the theme of “My Little Pony,” a popular 1980s animated television series created by American toy and game manufacturer Hasbro. With special decoration, the outlet is now called the “Friendship Magic Shop,” after the theme of the animated series. Sculptures of “My Little Pony” characters Twilight Sparkle, Rainbow Dash and Rarity stand in front of the ice cream store and attract young and old alike to line up, waiting for their turn to take photos with the animated characters. Next to the sculptures are two machines for visitors to try their luck winning “My Little Pony” toys using mechanical claws. Visitors can play interactive games to win game coins and grab the dolls. “I’m not a fan of the cartoon, but I have seen products made based on it everywhere in shopping malls, in book stores and on websites,” Xu Fengjiao told Shanghai Daily after winning a toy on the game. Characters from the cartoon are plastered over the glass walls of the store, while the ceiling is full of pink balloons. The TV series was so popular that many companies have cooperated with Hasbro to provide sideline products, including books, cups and clothes. These are all displayed in the “Friendship Magic Shop” so that people can have a closer look and buy what they like from online stores. There are also two places for fans to take photos. One is a wall full of the pony dolls, which people can take down and pose with. The other is a “magic” digital screen, where people can pose and take photos with little pony elements using an application produced by Meitu, a Chinese smart phone and image company. After taking the photos, people can also share them with friends via their phones and invite them to take part in the game. Before the pony-themed activity ends on August 15, people who buy a 258-yuan afternoon tea set will also receive a gift-pack, including coupons for Haagen-Dazs ice cream and products from the “My Little Pony” brand. The shop attracted nearly 600 people alone on the first day, almost double the number of clients the store usually sees on a workday. During the activity, people can also enjoy huge discounts in the “My Little Pony” flagship store on Tmall.com, an online shopping platform developed by Alibaba.